The Mission Church of St. Michael and All Angels was dedicated by the Bishop of Southwell on 14 December 1907. It occupied part of a green field site at the junction of Foxhill Road and Hillview, Porchester. At the time of its dedication it was virtually surrounded by fields, with only a few houses on the upper part of Hillview. 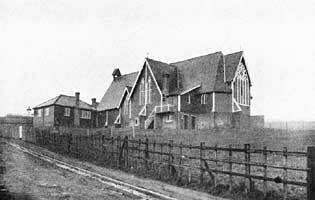 Much of Foxhill Road was not developed until after the church had been demolished in 1934. It was a daughter church of St. Paul’s, Carlton, and was supported by the same patron, the Earl of Caernarvon. It was a unique building, having a timber frame that had been purchased from a church in Surrey, which was dismantled, transported by rail to nearby Thorneywood Railway station and then by road to the site, where local bricks were used to provide the foundations. Even the bellcote housing resting on the west gable was wooden. The last service was held at the church on 29 April 1934 and it was demolished shortly afterwards. The large scale Ordnance Survey map from 1953 shows a building here on a different orientation and plan. This same building in 1961 is marked as Foxhill Gospel Hall (Plymouth Brethren). The site is now occupied by Foxhill Evangelical Church and several detached houses. St Michael and All Angels’ was apparently the temporary home of the old Saxondale font before it was moved to St Cyprian’s, Sneinton, and it is known that the altar and font of St Michael and All Angels’ were moved to St James’, Porchester in 1934.
and to Anthony Hood for the photographs.